TEL AVIV—According to an Israeli media report, the Israeli government has completed work on a massive, far-reaching plan that would expel an estimated 36,000 Palestinians from “unrecognized” villages in the Naqab Desert. If the plan is approved by the Knesset, Israel’s legislative body, its implementation could begin as soon as this year and would take four years to complete. News of the plan was first published by Israel Hayom – Israel’s largest Hebrew-language newspaper, funded by Sheldon Adelson, the top donor to both U.S. President Donald Trump and Israeli Prime Minister Benjamin Netanyahu. The plan — compiled by Uri Ariel, Israel’s Minister of Agriculture and Rural Development, and his staff — features the seizure of an estimated 260,00 dunams (64,247 acres) from Palestine’s Bedouins. The size of the territory in question and the high number of Palestinians set to be affected has led some to call the plan the largest “land grab” of Palestinian-inhabited land since 1948, when the state of Israel was founded. 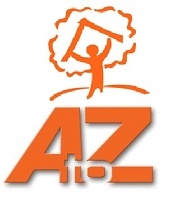 Israel Hayom’s report stated that, per the new plan, the Palestinian villages would be demolished and the ruins of their homes would then become the sites of “national projects,” infrastructure projects, and “security” installations after the forcible “transfer” of the land’s current inhabitants to other “state-approved” settlements such as Tel Sheva, Abu Talul and Umm Batin. The report noted that a major motivation behind the plan’s creation was the transfer of an arms-industry factory from another part of Israel to the Naqab, as well as the expansion of the “Trans-Israel Highway” system. I am happy to announce a revolution in the Naqab regarding the illegal construction. The enforcement agencies, together with the proper activities of the Bedouin Settlement Authority according to my instructions, created a new situation in the Negevb: in 2019, we will aspire to zero illegal construction in the Negevb. 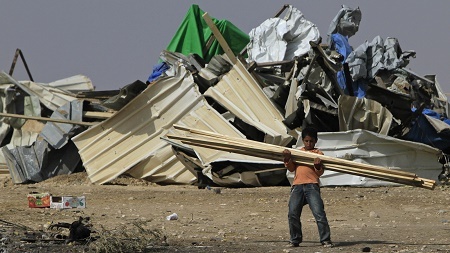 Photo: A Bedouin boy salvages timber after the demolition of his home in the village of al-`Araqib, in 2010. Israeli forces have demolished the village, located near the Palestinian city of Bi’r Sabi` (Beersheba, currently in southern Israel), for the 131st time in June 2017. Source: Tsafrir Abayov/AP.